A Virtual Entity in Flexie CRM is an entity that is not related to any of your existing entities or custom entities. We see the Virtual Entities when we create a Workflow of type Virtual Entity that is going to handle incoming data. The data comes from the third-party applications right into Flexie CRM with the use of Dynamic Endpoints that we create. The Dynamic Endpoints are URLs generated dynamically for you that you can copy and use in your third-party applications for the sole purpose to post data into Flexie CRM. The coming data is of unknown structure that you will access and use to create or update records for your existing entities. The accepted data format is JSON that represents a lightweight data-interchange format. The most widely used JSON comes in the form of an object or an array. Once the data is coming in after being posted into the Dynamic Endpoint URL, we can manipulate it within the workflow or we can transfer it into another manual workflow. To access and use this data we use the __data special keyword and encapsulate it with the double curly brackets. For example we can access first name, email and all the other fields represented in the example above. 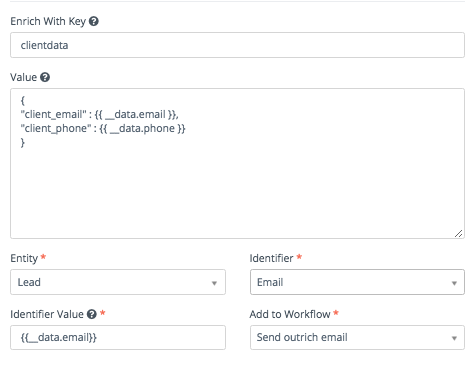 After using the data to create a known entity record, in Flexie CRM workflows you have the ability to push to another workflow. Usually this is done by finding the entity record that we created by a Unique Identifier field that may be an email and push it to a manual workflow. When using the Push to Workflow action, the data is transported to the manual workflow and can be used from there. The only thing changing, is the way how you access the data. This is the default way how to access the data when you use the Push to Workflow from a Workflow of type Virtual Entity. You could also create your own data structure by using the Show Advanced option in the Push to Workflow action and compose your key and structure. This way we access the raw data coming from the Virtual Workflow, but if we need only some basic information then we could use our own composed key and access it. To stay updated with the latest features, news and how-to articles and videos, please join our group on Facebook, Flexie CRM Academy and subscribe to our YouTube channel Flexie CRM.